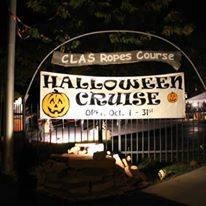 Unique Halloween Adventure from CLAS Ropes Course - Fun for the whole Family! Come enjoy an adventure riverboat ride on the lower Provo River. It is like a hayride, but a boat ride. There are over 100 pumpkins reflecting off the water. The Captian tells a story and a pirate attacks the ship and hands out candy.